Crash That Killed Seven Was Along 'Cursed' Stretch Of Bronx River Parkway : The Two-Way Sunday's tragedy took the lives of seven people, all from one family. In 2006, six people were killed near the same spot. Last June, another went airborne there — but both people inside survived. Authorities are investigating. This van plunged off the Bronx River Parkway on Sunday. All seven people inside were killed. 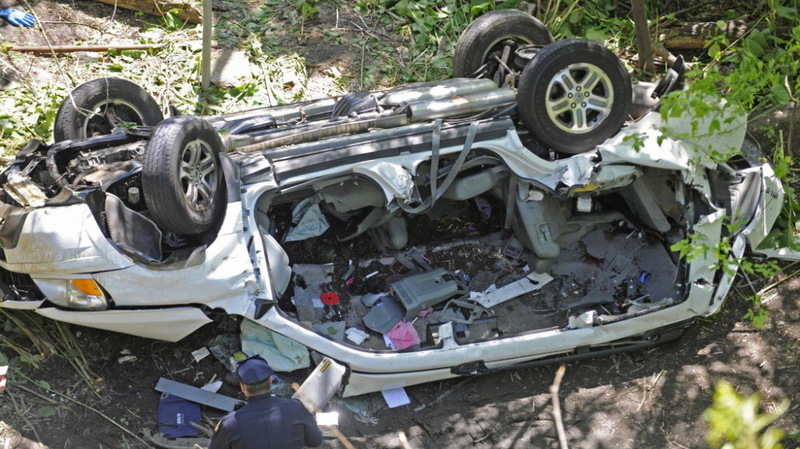 A horrible car accident Sunday in the Bronx, which killed seven people from one family, happened on a "cursed" section of the Bronx River Parkway where six people died in a terrible 2006 accident, New York's Daily News reports. It's also the same stretch of highway where last June "a car hit the median and sailed into the air, landing on E. 180th St.," the newspaper adds. "Both the driver and passenger survived." "Bronx Borough President Ruben Diaz says changes must be made, including higher railings along the highway, but also says drivers need to be careful.
" 'We call on all of the motorists to slow down. Perhaps we have to do better on signage perhaps. Perhaps we have do better visibility with law enforcement. Perhaps we have to warn people or have certain graphics or paintings on the ground,' Diaz said." The Associated Press writes that Sunday's tragedy occurred when an "out-of-control SUV barreled across several lanes of traffic on a highway overpass ... then plunged more than 50 feet off the side of the road and landed in a ravine on the grounds of the Bronx Zoo." The victims included three children. "In the 2006 case," the Daily News says, "six members of one family, including a 6-year-old girl, were killed when their Acura Legend went out of control, went over the concrete median and into oncoming traffic." Each accident happened between exits 5 and 6 of the parkway. A possible contributing factor, according to the Daily News: traffic tends to suddenly slow there, surprising approaching drivers. According to The New York Times, New York State Department of Transportation spokesman Adam Levin said the agency is "going to do our investigation into this accident and see if anything needs to be done to improve the safety of the area."